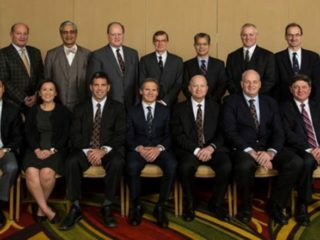 The American Board of Neurological Surgery (ABNS) was approved as a new examining board in medical specialties in 1940 by action of the Advisory Board for Medical Specialties [reorganized in 1970 as the American Board of Medical Specialties (ABMS)] in collaboration with the AMA Council on Medical Education. On August 15, 1940, the ABNS was incorporated. N. B. Burdete, N. C. Evans, and W. W. Downing served as signatories. The first official meeting of the ABNS was held in Chicago on October 17, 1940. There were 24 candidates for certification examined. The 100th official meeting was held September 23-26, 1986, in Salt Lake City, Utah. The 50th anniversary meeting was held in Boston, Massachusetts, May 15-18, 1990, when the 3672nd diplomate was certified. The 75th anniversary meeting was hosted in Chicago, Illinois on June 26th-27th, 2015, where longtime executive director, Mary Louise Spencer, was honored for her years of service to the board. The ABNS recognized the importance of physician leadership and announced the appointment of Dr. Fredric Meyer as the next executive director in late 2015. With the appointment of a highly accomplished, practicing neurological surgeon as the executive director, the ABNS demonstrates the commitment it has to the patient and the public. 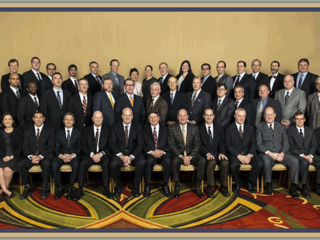 The ABNS has certified 7,142 neurological surgeons as of March 2018.